HK 30A ESC's w/simonk, Turnigy 2730-1300kv motors, 8x4.5 props, 2350mah 20c batt. I've had the battery near the front (side-to-side, pic 1) of the copter for a several flights and then saw that placing the battery lengthwise (2nd pic), closer to the back may be better. For my short time with the battery as in pic 2, I thought it flew better. 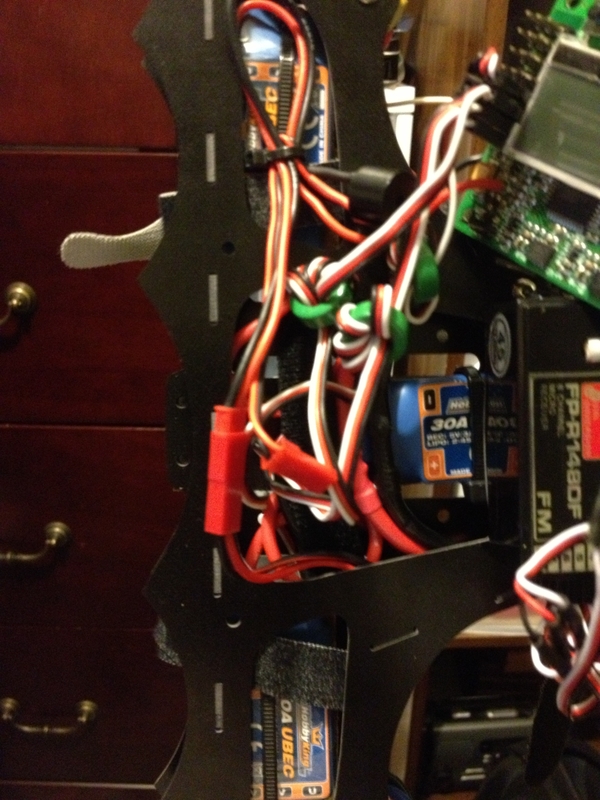 Both front motors do not get over 110[SUP]o[/SUP]F.
My battery in pic 1 position, tail motor gets about 130[SUP]o[/SUP]F.
Battery in pic 2 position, tail motor gets about 160-170[SUP]o[/SUP]F. Both, I think are too hot. I'm wondering if anyone knows why this may be happening. Should I try a different prop/motor? And, what battery position is better? The only thing you changed was battery position? I can't imagine that battery position is the reason for the temp difference. Just thinking here... Did any wires get looped around the esc wiring? Does the hot motor sound any different than the others? I'd pull it apart to make sure its not rubbing on anything Check the stators to see if there are any spots where the magnets are rubbing. Check the bearings. Make sure there is no dirt in the motor. Think about it, on a tricopter, the back motor is constantly spinning at a little higher rpm than the front motors, because it is tilted to keep the yaw constant. Now, when you shifted the weight a little backwards, that rear motor has to work a little more than before, or spin a little faster, thus the higher temperature. Best battery position? The one that gets your tricopter CG true. Make sure your bearings are good and lubed! Good point. I did not think about it from the standpoint that the motor is now carrying more of the load. Oh, and the load of the servo. Which may not be much, depending on what servo you use. how do you find true CG? just balancing the tri on the tip of your fingers? This is a question that still eludes me. On a normal quad it's easy just draw a line between opposing motors. But on a tri it's different I guess. I mean it's the point from where you have equal distances to all the motors, but how you find it I can't tell you. On a normal tricopter, draw an imaginary line between the front motors (you could use a piece of string here, a line, a wooden dowel, etc). The CG is at a third up the line that goes from back motor perpendicular to this imaginary line (or two thirds down from the back motor). Even a T copter should have the same characteristics. You've got my curiosity up. Tonight I'm going to overload one of the motors by placing some mass way out on an arm and see if I get a large increase in battery temperature and if that particular motor's temp also increases. Without seeing the results before hand, my guess would be the particular motor under the extra load would run hotter, but the battery temp being so terribly high, sounds very odd indeed. Yeah that is the centroid. Silly me, I knew how to do that. 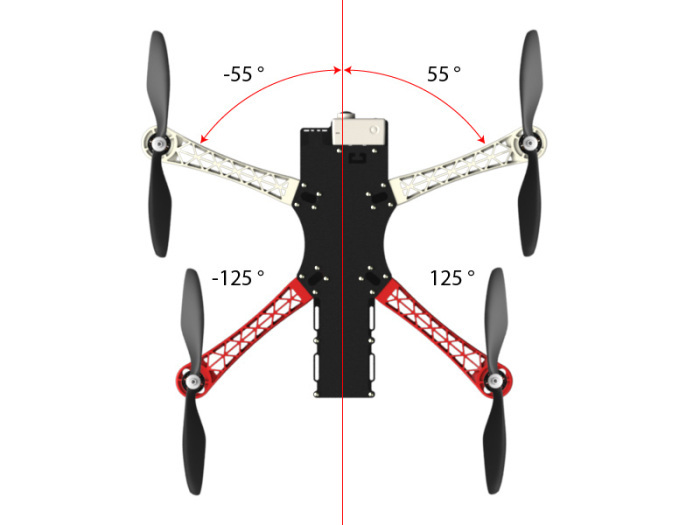 What bugs me is how do you calculate the centroid on a quad like the TBS Disco? I've found several possible methods but never tested or proved any. "Divide the four-sided polygon into two triangles by drawing a line between two diagonally opposing motors. Find the centroids. Then repeat step one but with the dividing line between the other two motors. Find the centroids. Now you have four centroids, draw lines between them that cross and that is the point." I also tried balancing the torques along the roll-pitch axes but it didn't quite work out. Another method which is more likely to be correct and is also based on torque calculations is to draw lines between the two front motors and the two back motors and then draw a line between the midpoints of the previously drawn lines. Center of this line would be the balance point of the pitch axis. Rrepeat the process for roll axis. Again, all these are just theories I've formulated. Would you clarify the "wires wrapped around the esc's. I have a bat bone, so I attempted to hide my esc's in the frame. I' don't know if this a contributing factor. btw, last flight motor got much hotter an started to perform badly. PIC of esc locations. Back/tailrotor is to the right. I doubt it is anything to worry about. I was wondering if a wire could be looped around the motor wire inducing some weird current. I had an esc catch on fire once and I think it may have been due to that reason. But, I'm no electrical guru, so I very well could be wrong. 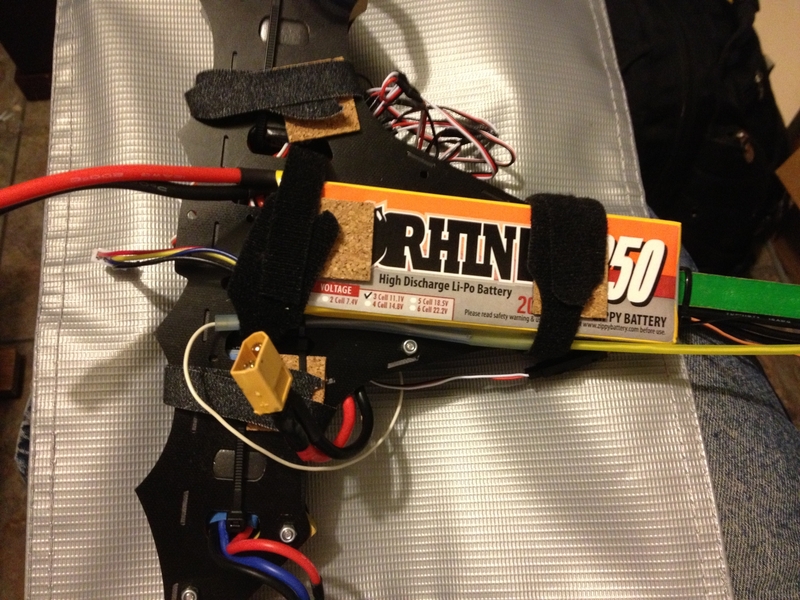 Okay, just a reminder of equipment => HK 30A ESC's w/simonk, Turnigy 2730-1300kv motors, 8x4.5 props, 2350mah 20c batt. 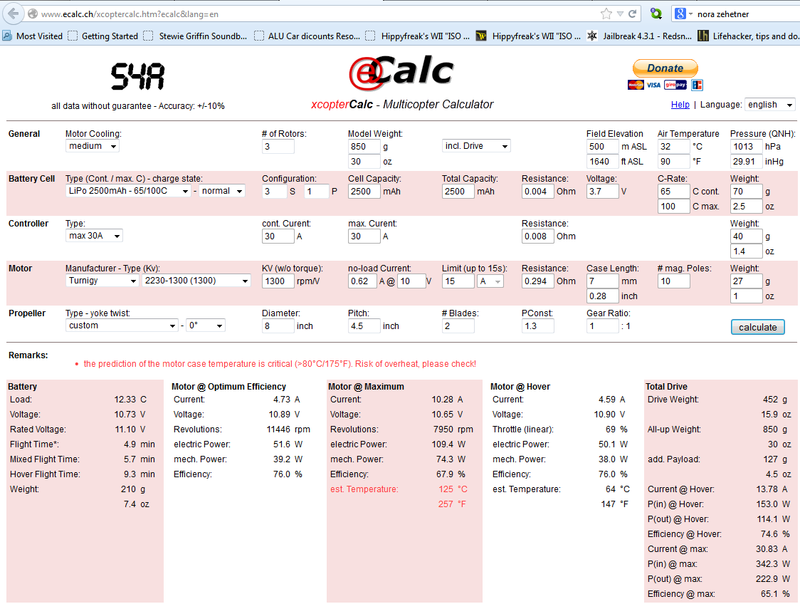 Went to http://www.ecalc.ch/xcoptercalc.htm?ecalc&lang=en and plugged in my numbers. Sure enough, it shows potential overheating. Although they did not have my exact motor, I picked another 1300kv motor. I'm guessing I have the wrong motor/prop combination! ^true, ish. 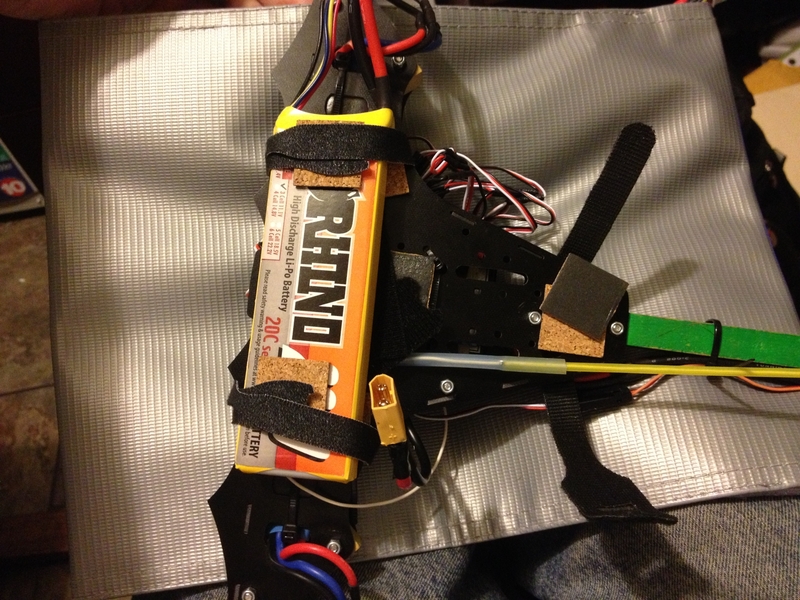 With a tricopter you want it to be a little bit nose heavy. Mostly because you get better tail response and the front two motors support more of the load. Why would anyone want to calculate anything when it is easier and absolutely accurate to MEASURE! Calculations are fine for design but measurements are for the REAL WORLD and frequently do not match calculations! C.G. ---- The point of balance. The chair back, knife edge or tube approach is best on small craft like the multi's we fly. High temps can damage NdFeB magnets very quickly unless they are a high temp version and I doubt that the better magnets get used in cheap motors.